The widespread popularity of menopause hormone therapy is a triumph of marketing over science and advertising over common sense. Drug companies and many health care providers view menopause as a disease to be treated — and hormone therapy is a direct response to that misperception. The National Women’s Health Network (NWHN) works to challenge this false claim that women’s bodies are somehow deficient at menopause and need replacement hormones to stay healthy. In fact, menopause is a normal transition that all women experience. Thanks to the NWHN’s advocacy efforts and the results of the Women’s Health Initiative — the largest long-term study of older women’s health ever conducted — women now know the truth: taking menopause hormone therapy increases the risk of breast cancer significantly. As a result of these findings, menopause hormone therapy use and breast cancer rates have both dramatically declined. In 2013, there were about 8 percent fewer cases of breast cancer than in 1990, which translates to 18,000 fewer women being diagnosed with the disease each year. Unfortunately, some providers, influenced by drug company promotions, pressure women to take hormones as soon as their regular menstrual cycles start to change. 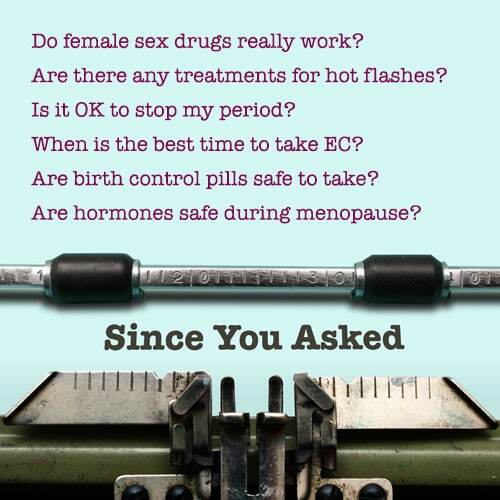 Too many women undergoing the menopausal transition are told that hormones are helpful — if they take the right drugs, at the right time, in the right way. This is called the “timing hypothesis” and isn’t valid. There is evidence that taking hormones at menopause can reduce symptoms like hot flashes and delay bone loss. Taking a combination of estrogen and progestin reduces the risk of bone fractures and colon cancer; taking estrogen alone can also reduce the risk of fractures. But findings from the largest and most rigorous study conducted to date clearly show that, for healthy women, the risks of combined hormones, including increased risk of breast cancer and serious cardiac events, outweigh these benefits. The NWHN believes that women who want to use hormone therapy to ease their menopausal symptoms should have medically accurate information about the risks and benefits of both short- and long-term use. Women also benefit from information on using non-hormonal options (including biofeedback, diet, and yoga) for their menopause symptoms. The NWHN fully supports and advocates for research in these areas. Women should be skeptical of products that claim to extend life, reverse aging, restore youth, or prevent disease without any adverse effects. In too many cases, these products not only don’t do what proponents claim, but also have dangerous health effects. We are committed to ensuring that women have access to accurate, balanced health information and services. Stay informed about this issue by signing up for our e- alerts, and by connecting with us on Facebook and Twitter.